The ‘outdoors’ is a physical and ideological space in which people engage with their environment, but it is also an important vehicle for learning and for leisure. 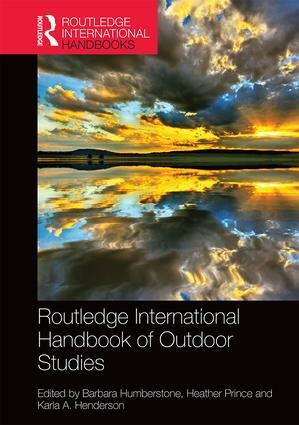 The Routledge Handbook of Outdoor Studies is the first book to attempt to define and survey the multi-disciplinary set of approaches that constitute the broad field of outdoor studies, including outdoor recreation, outdoor education, adventure education, environmental studies,　physical culture studies　and leisure studies. It reflects upon the often haphazard development of outdoor studies as a discipline, critically assesses current knowledge in outdoor studies, and identifies further opportunities for future　research in this area. With a broader sweep than any other book yet published on the topic, this handbook traces the philosophical and conceptual contours of the discipline, as well as exploring key contemporary topics and debates, and identifying important issues in education and professional practice. It examines the cultural, social and political contexts in which people experience the outdoors, including perspectives on outdoor studies from a wide range of countries, providing the perfect foundation for any student, researcher, educator or outdoors practitioner looking to deepen their professional knowledge of the outdoors and our engagement with the world around us. The Routledge Advances in Outdoor Studies series is a comprehensive and expanding book list that encompasses and integrates theoretical, practical and political aspects of outdoor studies, including education, leisure/recreation, adventure, therapy, nature-based sport, the environment (land & sea), sustainability, social justice and professional practice. In bringing together these dimensions in new and creative forms, this series will highlight new and innovative national and international research, enable greater accessibility to key critical developments, and strengthen interconnections between the underpinning disciplines.